October in Nova Scotia can be wonderfully sunny, with crisp mornings. For the best weather, visit towards the beginning of the month. Cross your fingers for good weather but pack a sweater and raincoat just in case. The average daily high in October is only around 13-15°C and the weather is noticeably wetter than in September. Early October is an ideal time to see the fall colours. Driving around Cape Breton, particularly the Cabot Trail, or the Wentworth Valley in central Nova Scotia is like stepping into an artist’s palate at this time of year. It’s also harvest time. Try out freshly picked apples in the Annapolis Valley or taste the latest vintages at one of Nova Scotia’s wineries. Many homes will be decorated with fall leaves and carved pumpkins on the doorstep – a celebration of autumn and also in anticipation of Hallowe’en on October 31st. 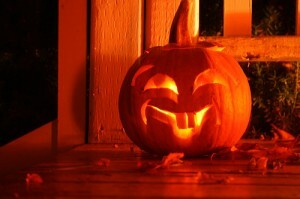 On that evening, kids traditionally go door to door ‘trick or treating’ for candies and sweets. Thanksgiving falls on the second Monday in October, a month earlier than in America. Buses, trains and highways are busy with people travelling to share a huge turkey dinner with their families. On the festival scene, the Celtic Colours Festival in Cape Breton – a series of concerts, dancing and storytelling in communities around the island – is a highlight of the month. It’s perfectly timed to compliment a trip to see the changing leaves on the trees. Towards the end of the month, things are more hit and miss. Some ferries stop running and many attractions close for the season.